Holly Koza, far right, president of the board of directors of the agency formerly known as the Partnership for Violence Free Families, joined with Executive Director Donna Dickman on Wednesday in announcing a name change for the agency. The non-profit, which offers referral assistance and counseling to usher residents through a wide range of societal situations, is now known as PASS (Prevention, Awareness, Support and Services) of Allen, Auglaize and Hardin counties. LIMA — New name. Same level of caring and commitment. The non-profit agency formerly known as Partnership for Violence Free Families, which provides education, programming and resource referral to the most at-risk members of the Allen, Auglaize and Hardin county communities, is now PASS — an acronym for Prevention, Awareness, Support and Services. The name change was announced Wednesday during an open house at the agency’s offices at 309 W. High St., Lima. The event was held in celebration of the 15th year of service for the state-certified provider of prevention-based services in partnership with the Mental Health and Recovery Services Board of Allen, Auglaize and Hardin Counties. While in its infancy the Partnership for Violence Free Families had a fairly narrow focus in attempting to curb family/domestic violence, over the past decade the agency has greatly expanded its services to include programs aimed at helping area residents tackle societal problems ranging from child abuse and bullying to alcohol and drug abuse, suicide and mental health wellness. Holly Koza, president of the agency’s board of directors, said during Wednesday’s event that she hopes the new name more accurately reflects the diverse programming offered by PASS. “PASS it is. From now on, that’s who we are,” Koza said to a room full of staff, board members and supporters. Donna Dickman, executive director of PASS, has been with the agency since its infancy in 2004 — when she was the lone employee. Fast-forward to 2019 and PASS employs 14 certified prevention specialists. During that same time frame, PASS and its predecessor grew from two programs — Assertive Community Treatment, or ACT, and the OLWEUS anti-bullying program — and today offers more than a dozen specialized counseling and referral services. The Partnership for Violence Free Families was created through a $250,000 grant from the Anthem Foundation of Ohio. It began as a coalition of representatives of more than 50 organizations in Allen County and was heavily dependant on donations in its infancy. Following the agency’s partnership with the Mental Health and Recovery Services Board of Allen, Auglaize and Hardin Counties, support groups are now free and open to the public. Support groups are offered for topics that include grief and loss, bipolar and depression issues, gambling addiction, LGBT issues, youth sobriety, loss of a loved one to suicide or drug abuse. PASS also provides education, programming and resource referral to the issues of child abuse, teen dating violence, child sexual assault, problem gambling, mental illness, drug overdose deaths and suicide, according to the agency’s website. While Dickman is pleased with the growth of the agency, she said staffers do not intend to sit on their laurels. “There are still gaps in the community that still need addressed,” she said. For more addition on individual programs, visit www.PASSaah.org or call 419-549-8530.
https://www.limaohio.com/wp-content/uploads/sites/54/2019/01/web1_New-name-PASS.jpgHolly Koza, far right, president of the board of directors of the agency formerly known as the Partnership for Violence Free Families, joined with Executive Director Donna Dickman on Wednesday in announcing a name change for the agency. 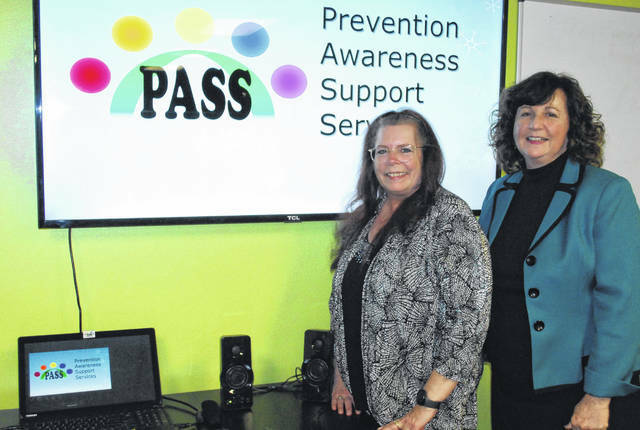 The non-profit, which offers referral assistance and counseling to usher residents through a wide range of societal situations, is now known as PASS (Prevention, Awareness, Support and Services) of Allen, Auglaize and Hardin counties.